As you can see, there is a Union Flag on the upper left of the Australian flag. Maybe you know about these kind of flags are exist in other world country flags too. Commonwealth GAME is an athletic competition held by countries that belongs to Britain every four years. It's already decided for next venue in Delhi of India in 2010. Commonwealth Game is including Olympic event and other sports for example lawn bowls, Rugby sevens and netball which is popular in the Commonwealth of Nations. While I was staying in Melbourne, Commonwealth GAME was also held at the same time, so I could enjoy the event and saw the city were gradually changed for preparing this game. 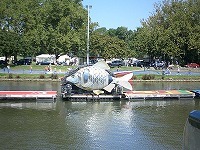 In the life line of Melbourne, Yarra River was set it up by the fish objets from each countries, and put some board for instruction of that country and each fish objets side of the river. I asked to my host family and we went to watch the cricket game. We watched Malaysia VS Australia and England VS Scotland. It's rare to gather all families together, so that night was really fun, and I could enjoyed Commonwealth Game too. 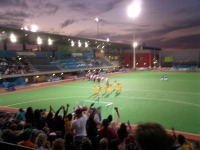 The score of first mach is 3 to 1, Australia won. And next second mach was, 3 to 2, England were won. Especially, this second game was really excited because England and Scotland are both don't want to lose each team, so audience is also cheered them and excited a lot. And I was not deliberately went Melbourne city on that day, but when I arrived the city, every road were closed and many peoples were standing side of the road. 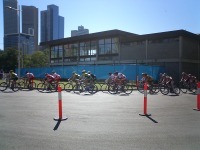 I asked some guys and they said bicycle race of Commonwealth Game were holding. They run fast across just in front of me, and after that I cheered them on television in the Bar. The Australian team was won on that race and every customer were loudly pleased. Commonwealth Game was held about while 2 weeks, and closing ceremony started. Opening ceremony was also amazing using many fire works and event in the stadium. On this day, I was in the St.Kilda Beach all day, and on my way to back home in the Flinders St Station, guards came to us and said "all trains are stopped". I was confused on that time, and I called to my host family. And she said "Commonwealth closing ceremony will hold tonight, so you must stay there, and you'll see beautiful event". 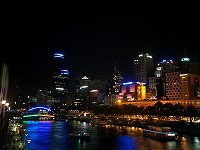 I gave up to take train, and walk toward to the Yarra River. Then suddenly I saw thousands of people were sitting beside the river! I thought something will happen in this place and I also took seat beside the river. After 10 minutes later, suddenly fire works started from inside the river! 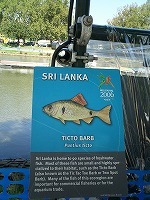 I was really surprised, and that fire works came from every fish objet. 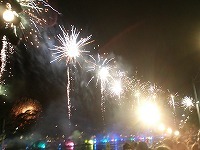 Every objet were lighted up by many colors and fire works were shot again and again. 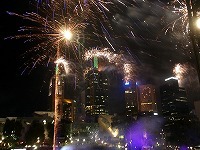 At last, fire works started from every rooftop of buildings! Is it possible to realize this kind of event in Japan? Maybe not. This was a big moment to notice me, how wonderful to get together every town and create 1 event, which I started to felt when I came to Australia. When they wanted to do any big event in the middle of the city, there are of course many kinds of business problems and politic problems are appear. But I think if the every citizens and politicians have same deep understanding, this may realize and become success. Most Japanese says, "If the city becomes bigger, human kind relationship will oppositely disappear." But I think if the many people gathered, size of the dream also expand infinitely. 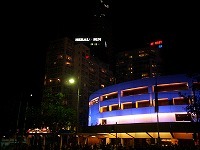 I hope Japanese city will also becomes full of cooperation and helpful town like a Melbourne city.